United Way of the Florida Keys is excited to share it will distribute a total of $185,000 in grants to local nonprofit agencies in 2017-18. 15 programs have been identified so far for funding through UWFK’s traditional funding process in one of three United Way focus areas: access to nutritious food for people in critical need; early childhood or after-school care with an educational or positive behavioral component; or safety net services, including information and referral or short-term emergency response. In addition to distributing $155,000 in grant allocations, UWFK is also releasing a request for proposals to organizations offering comprehensive after school and out of school time care in support of working families. This additional $30,000 investment in community support will help organizations serving children through all areas of the Keys. The 2017-18 grant recipients funded through the traditional allocation process were selected based on a scores calculated from a rubric submitted by United Way board members and community volunteers who reviewed applications and visited agencies in each region of the Keys. Rubrics rate agencies based on organizational capacity, budget, strength of program outcomes, and use of leverage and volunteers. UWFK is incredibly thankful to the community volunteers who spent time reviewing potential grant applicants and to all the agencies that applied for United Way funding! We look forward to seeing the successes of their good work. 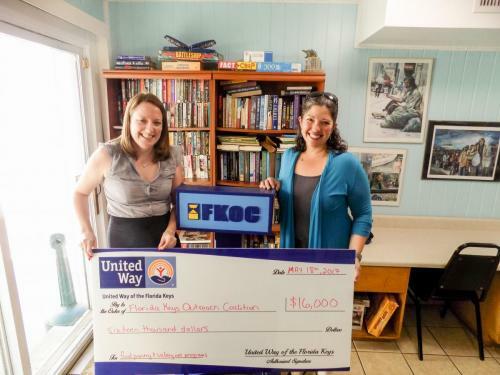 *Kate Bauer-Jones with FKOC's COO, Stephanie Kaple.